The CD166 antigen, also known as activated leukocyte cell adhesion molecule (ALCAM), is a single chain type 1 transmembrane glycoprotein, containing 10 potential N-linked glycosylation sites, and belonging to the immunoglobulin superfamily (IgSF). It shows a 100 – 105 kDa molecular weight, and is composed of five extracytoplasmic Ig-like domains linked to a 32-amino acid cytoplasmic tail through a short membrane-spanning region. The CD166 antigen is an adhesion molecule that binds to the CD6 molecule, or forms ALCAM-ALCAM homophilic interactions. Studies suggest that CD166 molecules can oligomerize at the site of cell-cell contact via their three C2-type Ig-like proximal domains. The CD166 molecule appears to be a non-lineage restricted molecule, expressed on a variety of cell types, including selected hematopoietic cells, endothelial cells, cortical and medullar thymic epithelial cells, bone marrow mesenchymal stem cells, fibroblasts, and hepatocytes. In peripheral blood, ALCAM is expressed on activated T- and B-cell subsets, on monocytes, on circulating dendritic cells, and weakly on granulocytes. While expressed in a wide variety of tissues, ALCAM is usually restricted to subsets of cells involved in dynamic growth and/or migration. In the thymus, the interaction between the CD6 molecule, as expressed on CD6+ thymocytes, and the CD166 molecule expressed on thymic epithelial cells may play a role in T cell development. 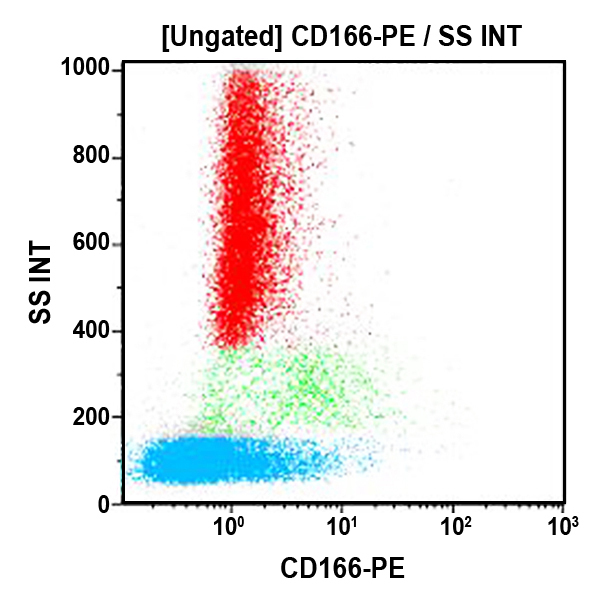 Other studies suggest that the CD166 adhesion molecule is involved in embryonic hematopoiesis, as well as in hemangioblast differentiation and capillary tube formation. Clone Description The 3A6 antibody blocks the binding of the CD6 ligand to its CD166 receptor as seen on adhesion experiments of CD6-expressing COS cells to thymic epithelial cells. The 3A6 antibody was clustered to the CD166 during HLDA 6.